Our Victory at Sea Imperial Porter is a bold, smooth brew with just the right amount of sweetness. We infused this robust porter with vanilla and San Diego’s own Caffe Calabria coffee beans. The subtle roasted notes and minimal acidity of the cold brewed coffee, balances perfectly with the sweet caramel undertones of the malt, creating a winning combination for your palate. From Anonymous of Spokane, Washington on 4/19/2018 . We were lucky enough to visit your restaurant in Temecula,CA last month and enjoyed the food and beer. Because the shirt we bought there was a bit too small, we ordered one online and it was received quickly and is of high quality material. 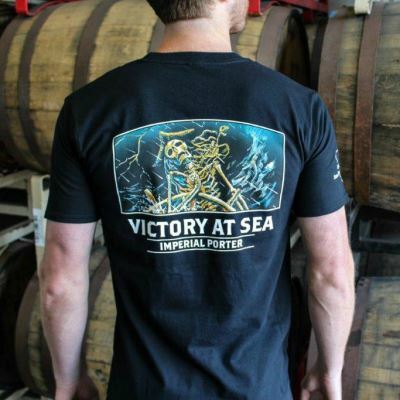 Too bad we couldn't have received a bottle of Victory at Sea with the shirt! Please open a Ballast Point in Spokane! From Sanchezaone of San Antonio , Texas on 3/22/2018 . From @AureliusBrew of Tallahassee, Florida on 1/8/2018 . Nice quality fabric, good fit, good looking T.